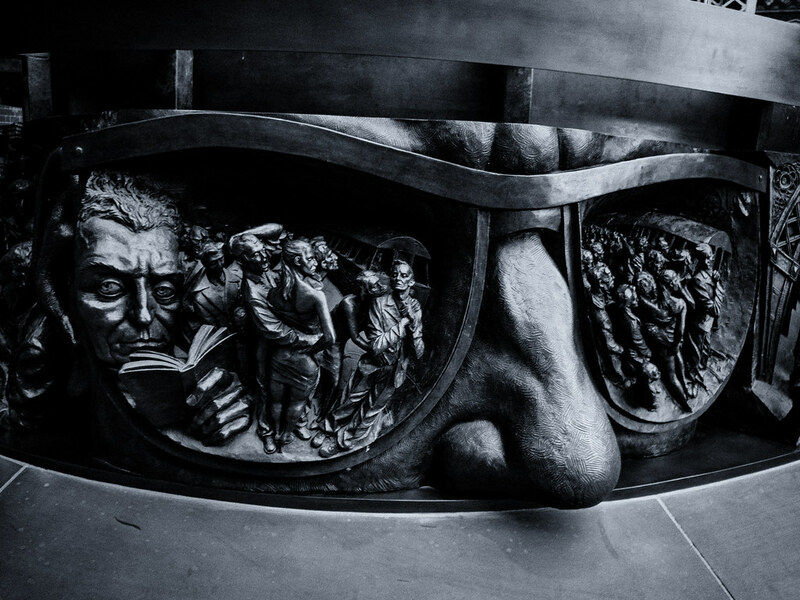 I have been spending a lot of time more recently posting reviews of lenses. While that generates a lot of hits, it isn’t as much fun as getting out to new places (or old places) with a camera. A week or two back my train was diverted to King’s Cross Station in the morning due to a problem on the Moorgate line I get to work. 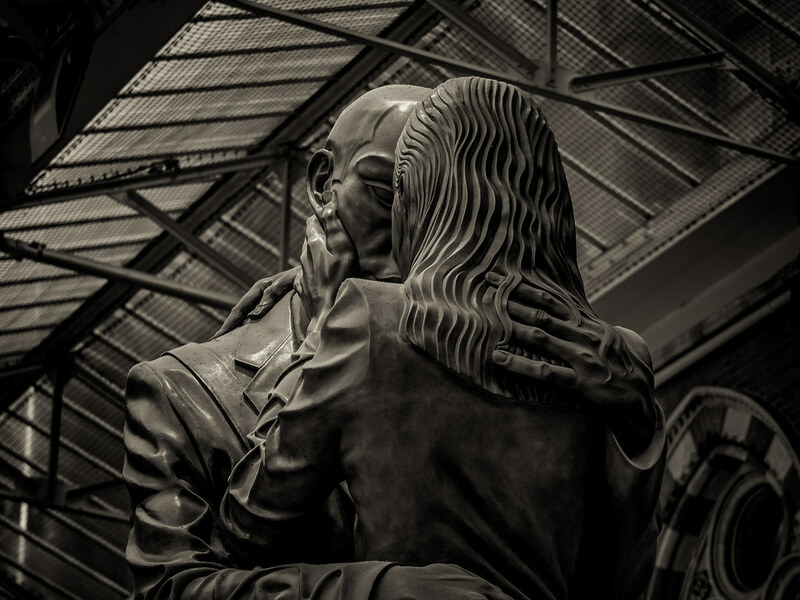 The queue for the tube was horrendous, so I decided to spend 10 minutes with my E-M5 rather than attempting to join the crush. King’s Cross is mid-redevelopment at the minute, but the new roofed area joining the suburban service platforms to the mainline platforms has opened and the old 70’s extension has closed, prior to its demolition and conversion to a public open space (I’m expecting benches, public art and possibly a water feature). 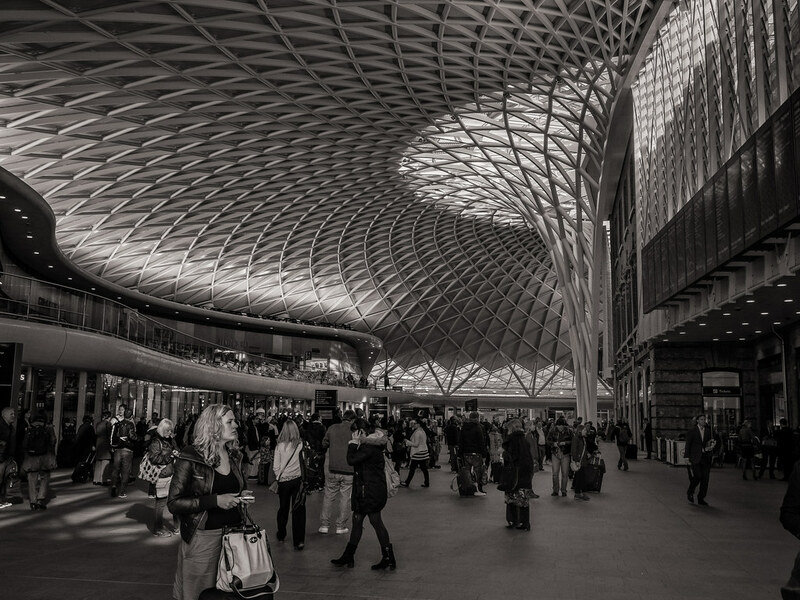 King’s Cross railway station, is a major London railway terminus, opened in 1852. It is on the northern edge of central London, at the junction of Euston Road and York Way, in the London Borough of Camden on the boundary with the London Borough of Islington. 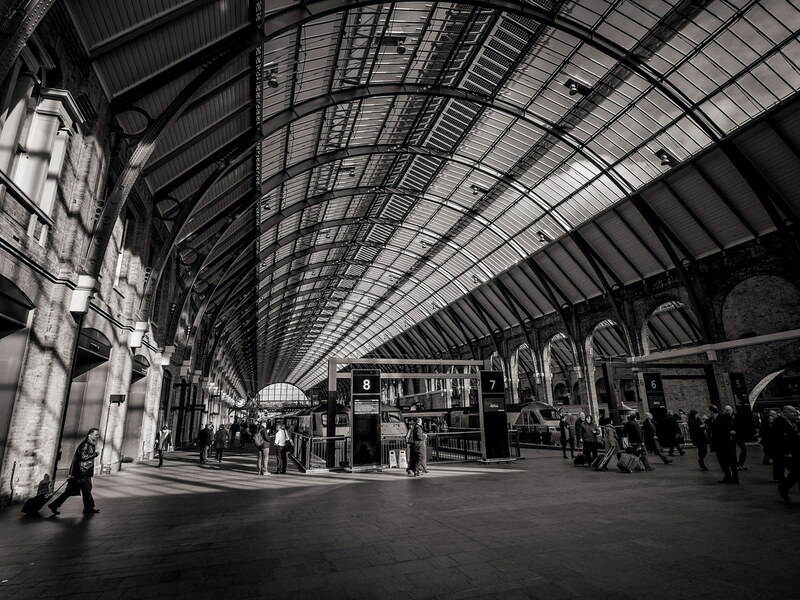 King’s Cross was built as the London hub of the Great Northern Railway and terminus of the East Coast main line. 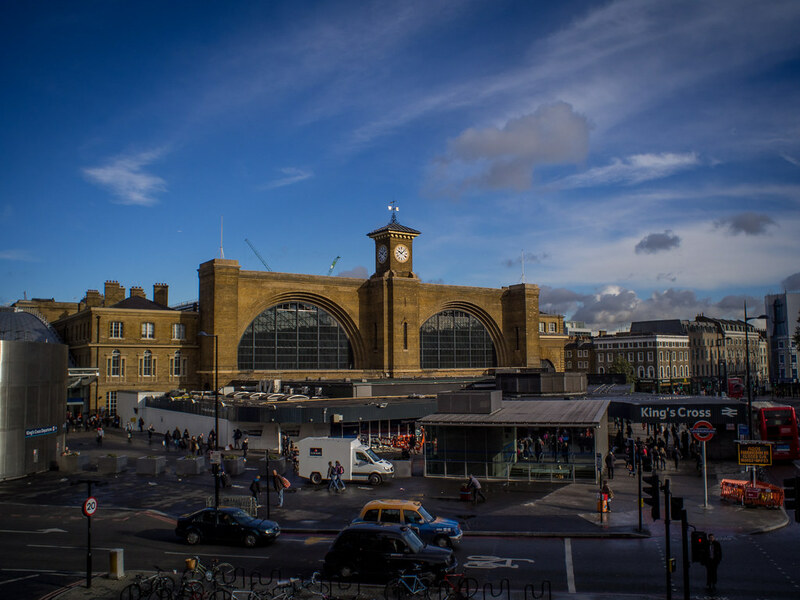 It took its name from the King’s Cross area of London, named after a monument to King George IV that was demolished in 1845. 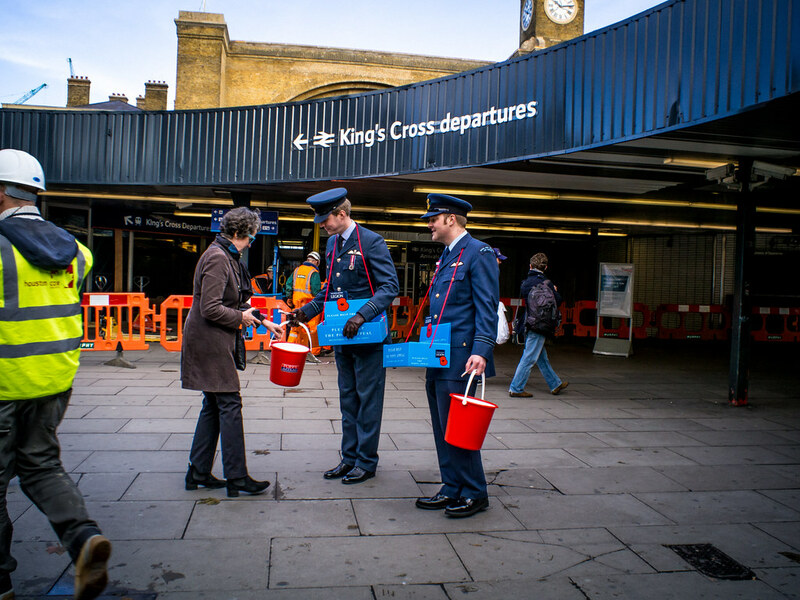 In 2005, a £500 million restoration plan was announced by Network Rail. 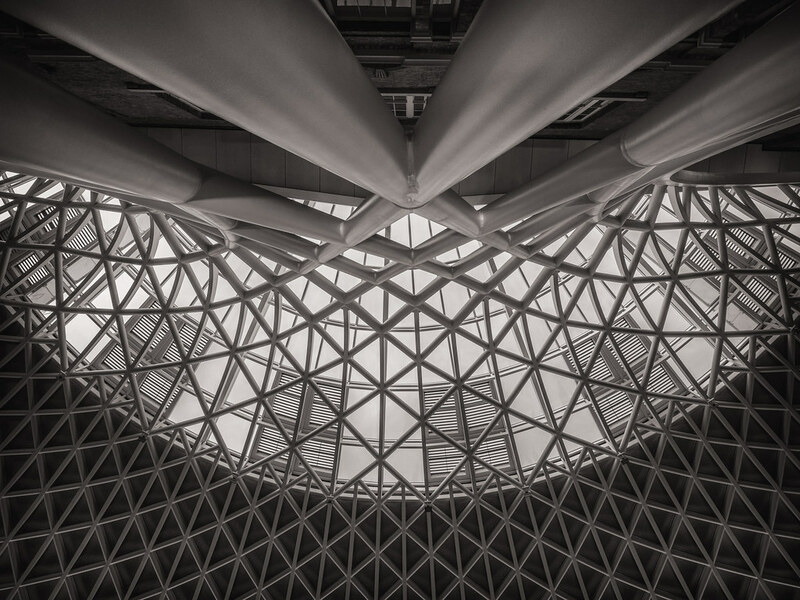 The plan includes a thorough restoration and reglazing of the arched roof of the original station and the removal of the cramped and congested 1972 extension, to be replaced by an open-air plaza, scheduled for completion in 2013. A new semi-circular departures concourse, opened to the public on 19 March 2012, has been built in the space directly to the west of the station behind the Great Northern Hotel, some outbuildings of which have been demolished. 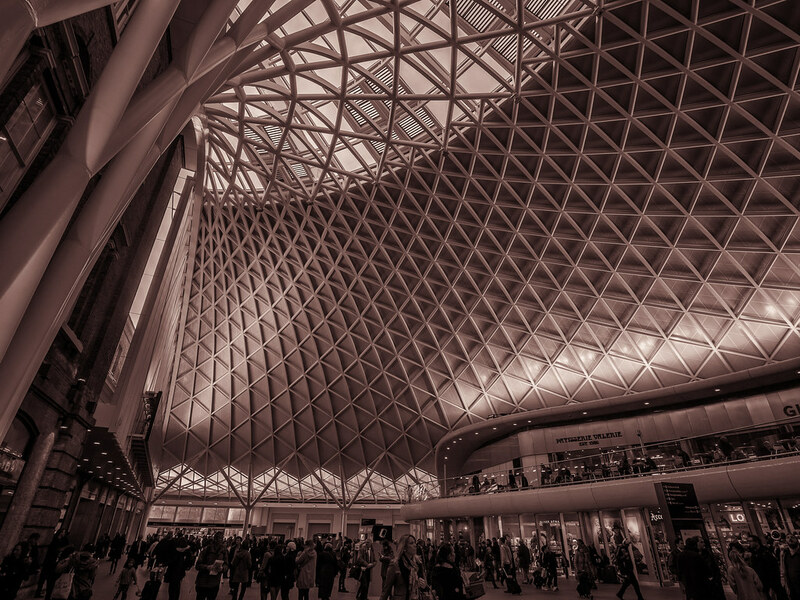 It is intended to cater for much-increased passenger flows and provide greater integration between the intercity, suburban and underground sections of the station, facilitating interchange between King’s Cross and St Pancras. 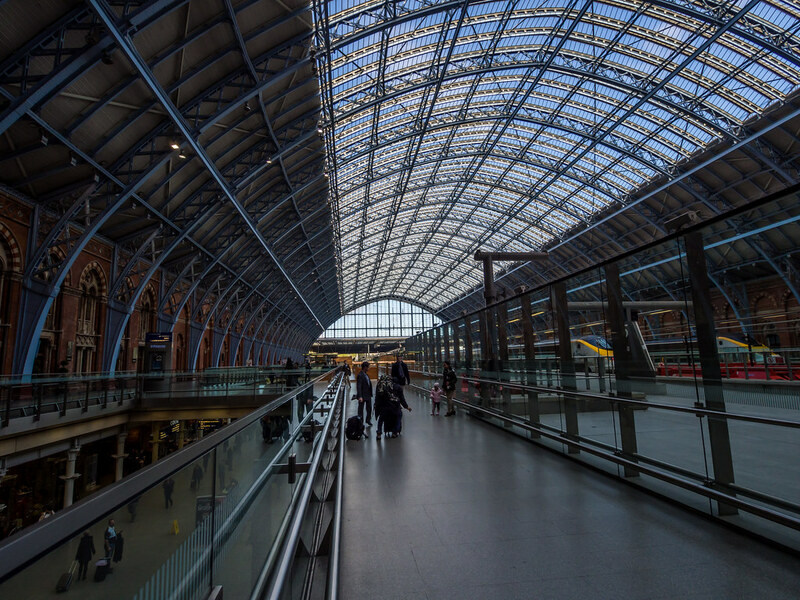 The architect claims that the roof is the longest single-span station structure in Europe. The semi-circular building has a radius of 54 metres and over 2000 triangular roof panels, half of which are glass. 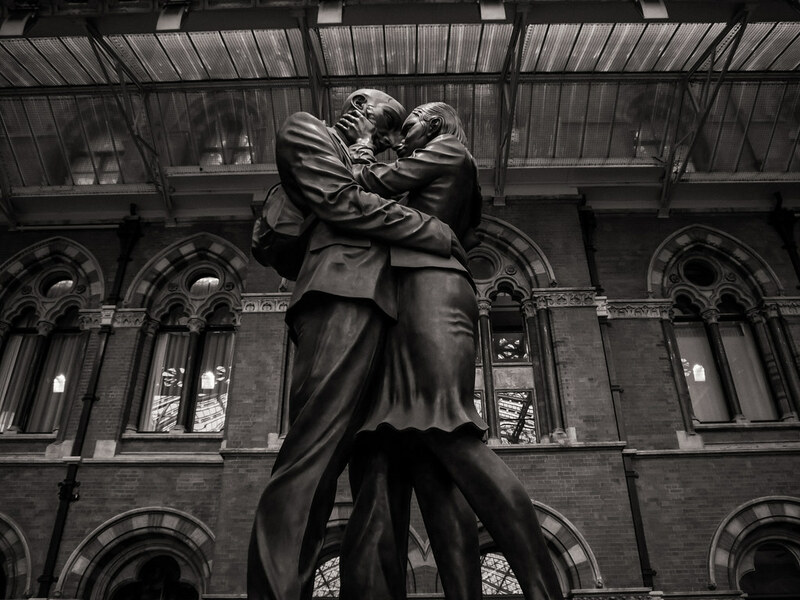 Of course, while I was there I couldn’t avoid St Pancras, one of the most beautiful buildings in London with one of my favourite art works (the Meeting Place). 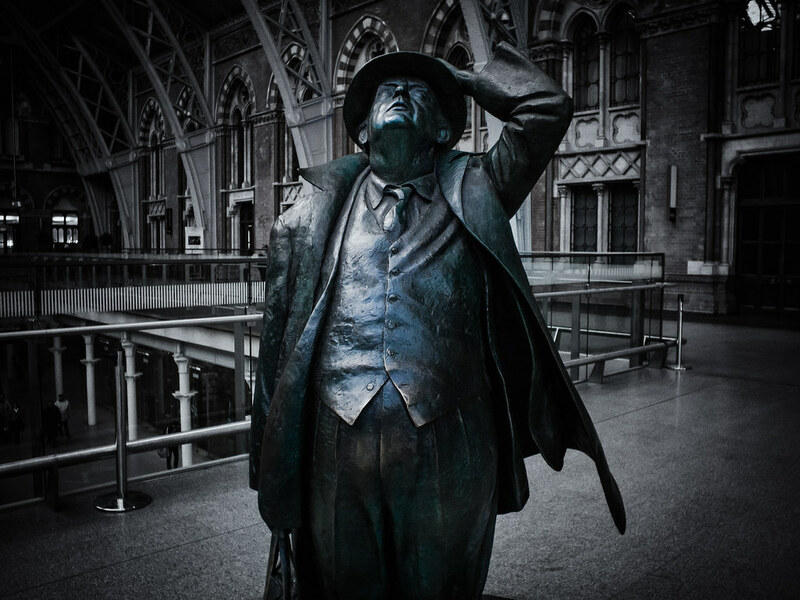 There is also a nice bronze of Sir John Betjeman (the poet who campaigned to prevent St Pancras’ demolition) there. 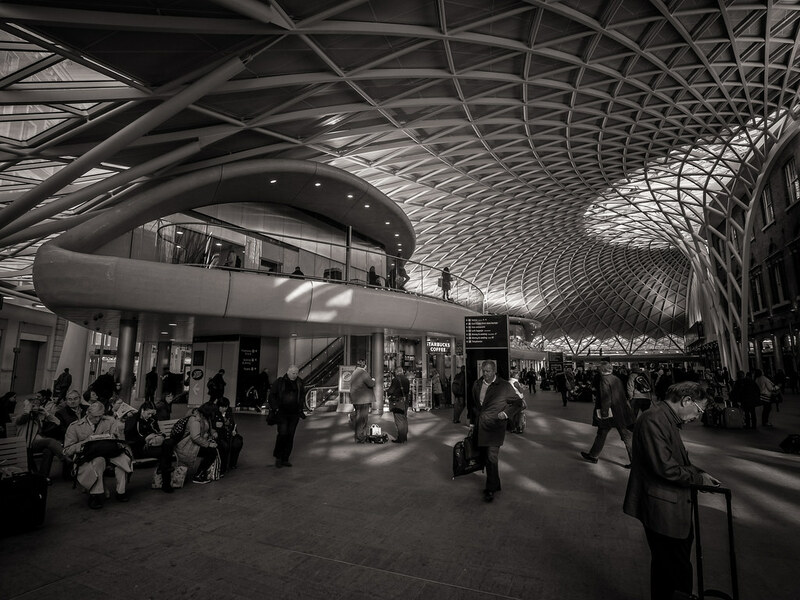 This entry was posted in Uncategorized and tagged 15mm Body Cap, 9-18mm, E-M5, King's Cross, O-MD, Olympus, Olympus 75mm. Bookmark the permalink. ← Voigtländer 25mm. The original and the best? Best regards from Norway, Norbert.